Seven Layer Bars (aka Magic Bars) get a magical makeover with old-fashioned oats, walnuts, a handful of mini chocolate chips, dried cranberries, and low-fat sweetened condensed milk. They’re a dessert you’ll want to keep in the family cookie jar. SPECIAL OFFER: SchoolFamily.com readers can purchase No Whine With Dinner at 30 percent off the list price, and get free shipping, by ordering the book here and using this promo code: FS2011. Lightly oil or coat a 9 x 13-inch baking pan with nonstick cooking spray and set aside. Spread the oats evenly on a baking sheet and bake until lightly browned, 8 to 10 minutes. Stir occasionally to ensure even browning. Remove and set aside. Place the walnuts on the same baking sheet and bake, stirring occasionally, until lightly browned and fragrant, 3 to 5 minutes. (Keep a watchful eye on the nuts so they don’t burn!) Remove and set aside. Place the toasted oats in the bowl of a food processor and process for 10 seconds. Add the beans, wheat germ, butter, canola oil, and salt and pulse until well combined. Press the mixture into the bottom of the prepared pan, and smooth down evenly with your fingers or palms to form a bottom crust. 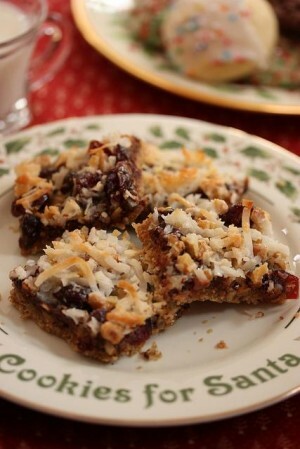 Top evenly with the chocolate chips, cranberries, walnuts, and coconut. Pour the condensed milk evenly over the layers. Bake 22 to 25 minutes, or until the coconut is golden brown. Cool on a wire rack and cut into 30 1¾ x 2-inch bars. Best if stored in the refrigerator. Note: You can easily modify this recipe to be gluten free by eliminating the wheat germ (or switching to ground flaxseed), and by using gluten-free oats. For a tree-nut-free recipe, nix the walnuts and replace them with 1/2 cup roughly chopped toasted, unsalted pumpkin seeds (also called pepitas) To reduce the sugar, replace the sweetened shredded coconut with unsweetened. Two tablespoons of sweetened coconut has 5 grams of sugar—that’s over a teaspoon—while the same amount of unsweetened coconut has 1 gram. I was a little skeptical because the crust isn't sweet at all, but put all together, it is outstanding. The original version is a favorite of mine and my three kids. I didn't mention that it was made any different and I don't think they even noticed. Awesome!